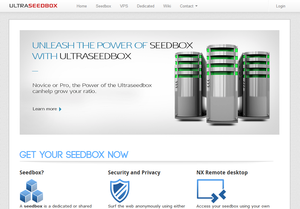 Today, an old favorite, UltraSeedbox, is going to present us, with the help of Enon, four of their packages. The company is already 3 years old, based in India and has got a ton of positive reviews around the NET. You can check some of them out here. The seedbox packages names are all based on cold weather. What do I mean? Well you’ve got Thunder and you’ve got Storm! These four monthly packages are all Shared plans (you also share the IP with two more customers) but do not let this scare you. Their Gbps lines will not let you notice that. The cheapest package “Thunder” starts with a 450GB disk space and you can go up to 900GB with “Storm”. The boost up versions “10G”s can reach up to 10Gbps (Down) speed while the smaller versions are at a 1Gbps line. The BW might be limited but you can buy up to 3TB of extra BW per plan for the cost of 3eu/TB (~$4.10). They all come preinstalled with OpenVPN, ruTorrent (you may also choose Deluge or Transmission) and you are allowed to use Public Trackers! There isn’t any limitation on the number of active torrents either. Regarding support, you can either email them for any presale questions or open a ticket if you are already a customer. Depending on your problem it can take from 3 hours up to 12 hours to get a reply. Finally you can grab a seedbox today for as low as 14.95eu (~$20.50) per month (you can go 5% lower for every single month if you use our coupon, check the table below), pay through Paypal, Payza or anonymously with Bitcoin and have it ready within the next 6h. None of the plans got a trial or a money back guarantee term. You can still get your money back though if they fail to deliver your seedbox within 48h or if you keep facing problems which they can’t resolve. – Data Retention: As part of our commitment to protecting your privacy, upon the expiration of your services with us all stored content will be instantly and irrecoverably destroyed. – Account Deletion: Due to legal obligations in maintaining the accuracy of historical invoices, even if you were to delete your account, the majority of the information we store would need to be preserved within those historical records. A couple months into my service they changed their policies to not allow public trackers anymore. I don’t remember getting any sort of notification about this policy change, i just noticed that for several months in a row i had virtually no traffic whatsoever. First two months were great, though. After that it’s basically been a waste of money.